Women More Likely to Recycle? A “for profit” ewaste collector moved in opposite of us. Their entrance is on Eastshore Hwy. Make sure you come to the southwest corner of 2nd and Page to find us. If you wish to help our computer donation program and/or receive a tax deductible receipt you need to recycle with us. 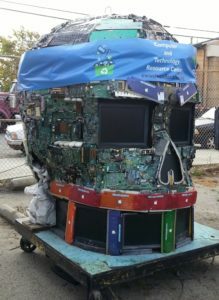 When in doubt look for the skull made out of computer parts! We now offer FREE drive wipes on all 2009 and newer Macbook Pro and Air.